Alert! Don’t Buy FastTrack Hooks Before Reading This! 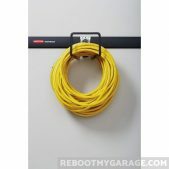 Rubbermaid FastTrack hooks don’t attach to the garage wall. They attach to the Rubbermaid FastTrack rail. The beauty of this system is that you can easily move the hooks around without drills and screws. Just unlock, move, and lock again. 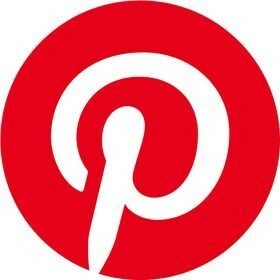 Looks at the images to see how this works. Snap the cover over the rail. After the rail and cover are installed into the wall, start adding in your hooks. 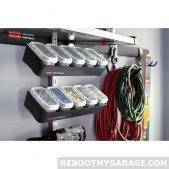 The Rubbermaid FastTrack is the third garage wall organization system I’m studying for my own garage. 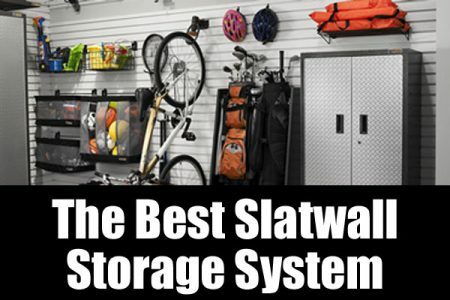 The Proslat Slatwall and the Gladiator Slatwall garage organization systems are still attractive contenders. But right out of the gate, I can see FastTrack is going to be a tough competitor to Proslat and Gladiator. It’s tough, sturdy, durable and seriously cost-effective. 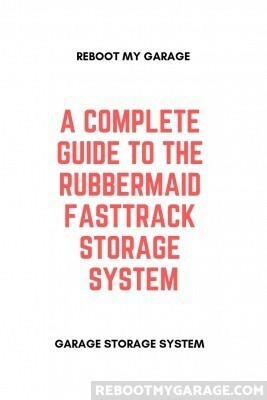 Is the Rubbermaid FastTrack system any good? Yes, the FastTrack system is fairly-priced, sturdy and offers a healthy choice of hooks, bins, cabinets and shelves. 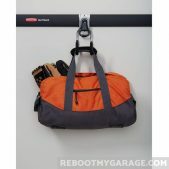 It’s obvious that Rubbermaid tested the garage storage system on real garage owners. The Rubbermaid FastTrack hooks are hefty and well-shaped. The shelves have edge lips to keep stuff from falling off. You can buy a vertical sub-system to hang bins and sports balls. 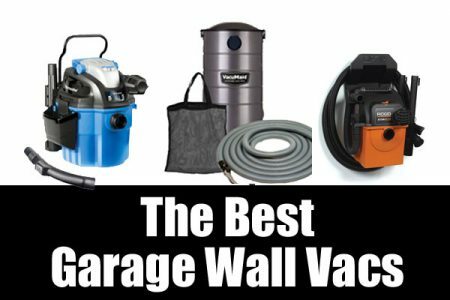 You will find many similarities between Gladiator Slatwall and the Rubbermaid FastTrack. The FastTrack system is less expensive. 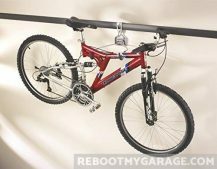 Hang Bikes up to 50 Lb. Hang Drills, Mallets, Rakes, Small Hoses, Electrical Cords, Beach Chairs and Ropes Up to 25 Lb. 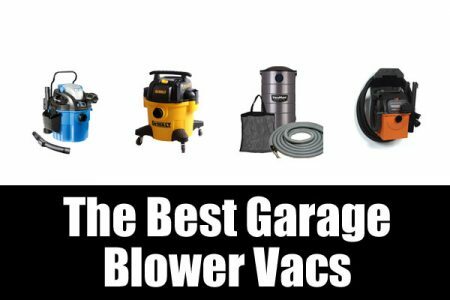 Hang Coolers, Hammers, Small Hoses and Hand Tools Up to 25 Lb. 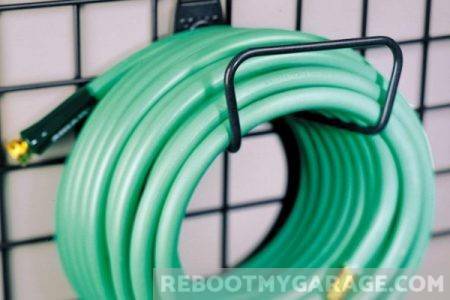 Hang Hoses, Electrical Cords and Rope up to 50 Lb. Hang Ladders, Backyard Games, Step Stools, Yard Equipment and Power Tools up to 50 Lb. 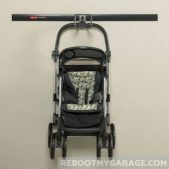 Hang Tennis Rackets, Baby Carriages, Shovels, Brooms, Scooters and Toys up to 50 Lb. Store Trimmers, Edgers, Lawn Trailers and Weed Eaters up to 50 Lb. 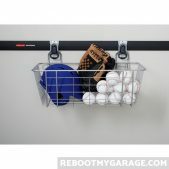 Store Baseball Bats, Hockey Sticks, Brooms and Rakes up to 50 Lb. Store Extension Cords, Toys, Duffel Bags, Hoses and Pitchforks Up to 50 Lb. Store Bottles, Paper Towels, Garden Tools and Cleansers up to 25 Lb. 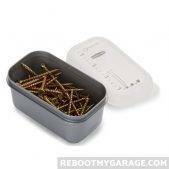 Store Screws, Nuts, Nails, Washers and Bolts up to 25 Lb. 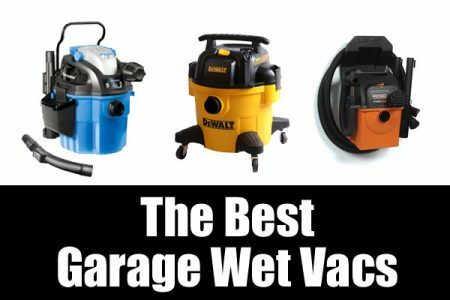 Store Cleaning Supplies, Auto Supplies, Flashlights, Paint, Tools and Hardware up to 50 Lb. The heart of the FastTrack Rail system is the FastTrack Rail. These rails range from 32″ to 84″ wide. The rails are a proprietary channel design. 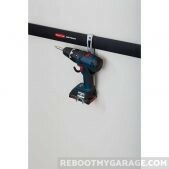 You mount the rails horizontally on your garage wall studs. You can mount FastTrack rails on 16″ or 24″ studs. The rail’s mounting holes are pre-drilled. The rail kit comes with all mounting hardware. Accessories lock onto the rail. 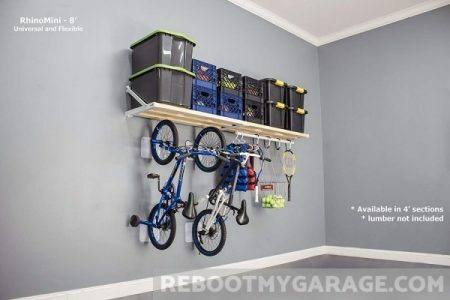 After you get a couple of these on the wall, open the Rubbermaid toy chest of storage solutions. Rubbermaid sells many rail storage options. Keep reading to learn the whole story. 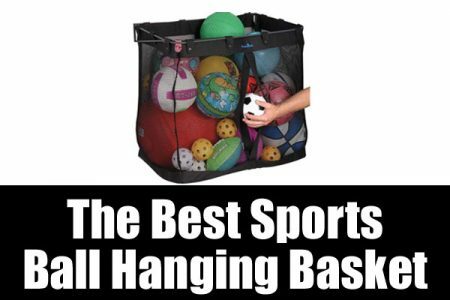 The horizontal system accepts hooks, a ball basket and vertical rails. The vertical rail system accepts shelves, bins and cabinets. 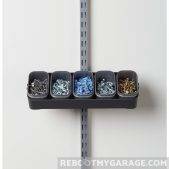 Each of these hooks is suited to carrying out multiple garage organizing duties. Read below for more information about each hook’s shape and load capacities. 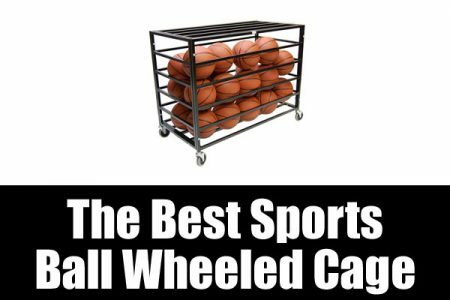 FastTrack also offers a wire mesh basket and a ball rack. The Vertical Bike Hook holder 50 lb. FastTrack offers both a vertical and a horizontal bike hook. You only need one horizontal bike hook to carry a bike frame. Both hooks carry 50 lb. 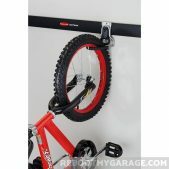 Rubbermaid calls it the Vertical Bike Hook, because it allows you to hang your front tire from the wall. Check out the Horizontal Bike Hook below. The Vertical Bike Hook has a nice meaty grip and a rubber cover to protect the bike wheel. You hang the bike from its front tire. The Vertical Bike Hook supports bikes up to 26 inches and 50 lb. and measures 15 W. x 4.5 H. x 1 D. inches You might also be interested in learning other ways to store your family’s bicycles here. 5 Stars The Perfect Way to Store Bicycles! 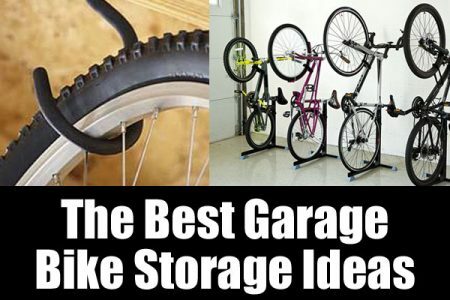 July 4, 2018 I have 13 bicycles on 2 walls in my garage and over the last 30 years have found the Rubbermaid system is by far, the best way to store bicycles. Usually you see two hooks holding a bike horizontally across a wall. 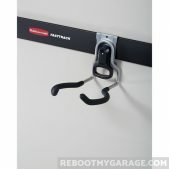 Rubbermaid designed the Horizontal Bike Hook with a wide surface area to enable you to stead a bike on just one hook. This hook spreads the load across two surfaces. 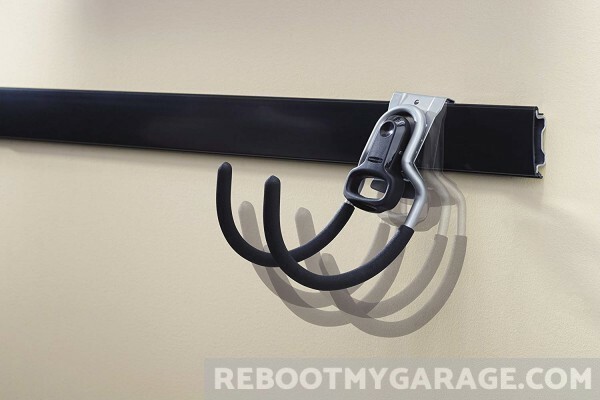 The Horizontal Hook hook carries bikes from 12 to 26 inches. The rubber coating protects the bike’s frame and paint. The hook is well thought out. You can fold it against the wall when it’s not in use. This beats running into an empty hook. 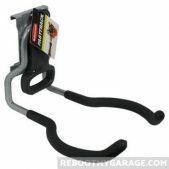 The Horizontal Bike Hook carries up to 50 lb. and measures 8 W. x 10.4 H. x 12.8 D. inches. The FastTrack Compact Hook is a shorter double storage hook. It holds its cargo close to the wall. 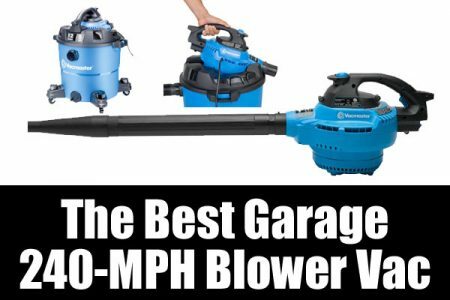 This is good for steadying heavier items such as power drills. The scoop in the hook gives support, and keeps contents from falling out. Use the Compact Hook to hang bike helmets, hand-held power tools, cords, small hoses, camping chairs and ropes. The hook’s rubber coating protects objects from scratching. The Compact Hook holds up to 25 lb and measures 3.1 W x 8.4 H x 3.1 D inches. Note that hoses can get heavy, so check out hose weight guide before using a 25 lb. load hook to carry a big hose. The Cooler Hook holds 25 lb. There’s something very “right” about Rubbermaid offering a Cooler Hook. To me, the cooler hook says “We “get” our customers. We understand that they like to camp and relax in the back yard. They want easy access to outdoor entertainment gear such as coolers.” Especially because coolers are one of the bulkier items I need to store. But there’s something very odd about a “cooler hook” that holds a cylindrical drink cooler. My cooler is a bulky rectangle. It would not fit on this hook. Gladiator sells a storage bin holder that doubles as a cooler holder that Rubbermaid might emulate. The FastTrack Cooler Hook holds 25 lb. and measures 4.2 W. x 6.5 H. x 3 D. inches The hooks turn up slightly at the end to prevent anything from slipping off. 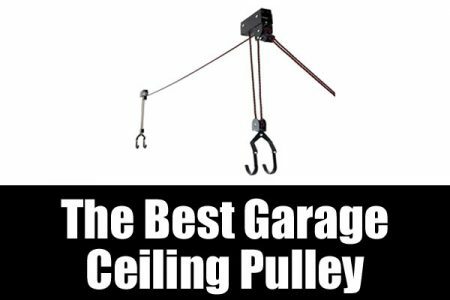 It’s a very good shape to hang small hoses, hoses, pails and hand tools such as hammers and mallets. The Hose Hook holds up to 50 lb. The Rubbermaid FastTrack Hose Hook has a really tall end lip to keep the hose from slipping off. The hose resting area is 10 in. wide. tip is 6″ high. Any hose weighing 50 lb. will fit comfortably on this hook. 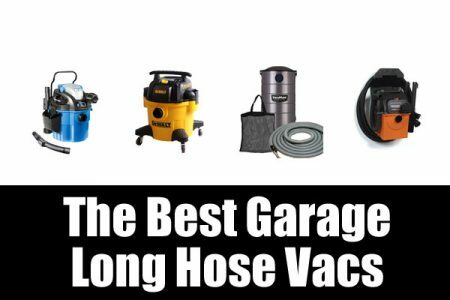 The Hose Hook is also perfect for storing electrical extension cords, beach chairs and rope. Learn more about heavier hose weight storage requirements here. The hard part about storing ladders is having enough resting area for the top part of the ladder to rest comfortably on the hook. 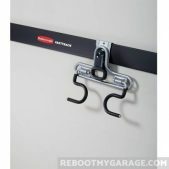 The Rubbermaid FastTrack Ladder Hook offers a deep resting area to hang your ladder. The ladder rests on a 13 in. long area. 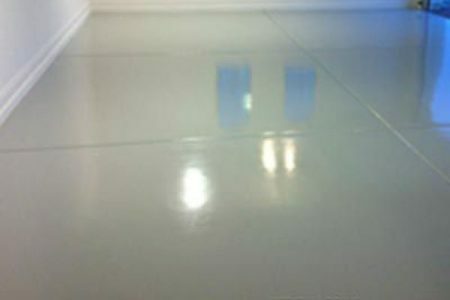 The rubber coating protects and grips the ladder surface. The Ladder Hook will hold up to 50 lb. Use one Ladder Hook to store the ladder vertically. Use two Ladder Hooks to store it horizontally. Rubbermaid also suggests the Ladder Hook for hanging croquet mallets, step stools and garden power tools such as leaf blowers and lawn trimmers. 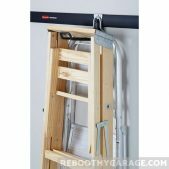 Learn more about how to store a ladder here. 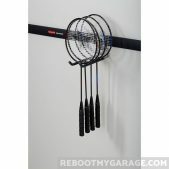 Finally a place to put the badminton rackets! Hang items up to 10 in. wide on the rubber-coated Multi-Purpose Hook. 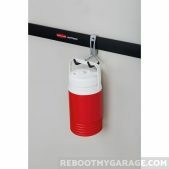 This is an extra deep and hook that holds 50 lb., so you can throw almost any garage item at it. The Multi-Purpose hook will hold toys, brooms, beach chairs, leaf blowers, skate boards and power trimmers. The hooks have protective lips to prevent items from falling. The Multi-Hook is a double hook, with a 3 inch gap between the two horizontal parts of the hook. 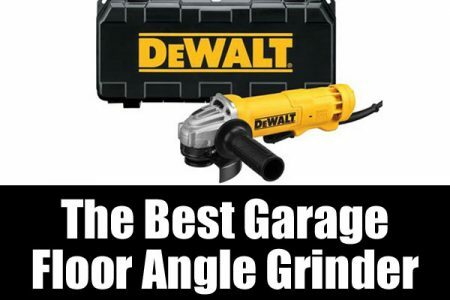 Use the gap to hang hammers or badminton rackets, drills, leaf blowers, lawn edgers, string trimmers, rakes and other garden tools. The Power Tool Hook gives you 15 inches of depth to hang yard power tools and bigger gear like cloth lawn tractor trailers. The Power Tool Hook locks firmly into the rail system but you can also mount this hook directly into a stud. Two hooks grab the long part of the tool you’re hanging in their curved design. If you have a set of rechargeable tools, you can line up a set of Power Tool Hooks so they’re all near the recharge power source. This hook carries up to 50 lb. and measures 5.1 W. x 3.8 H. x 15.8 D. inches. The 2-Handle S-Hook is really two hooks that latch onto the Rubbermaid FastTrack Rail system. The S-Hooks are good for hanging anything with a long handle, or that has a long, tapered design. Use it to store baseball bats, skis and rakes, paint rollers, shovels and hoes. The S-Hook holds a combined weight of 50 lb. 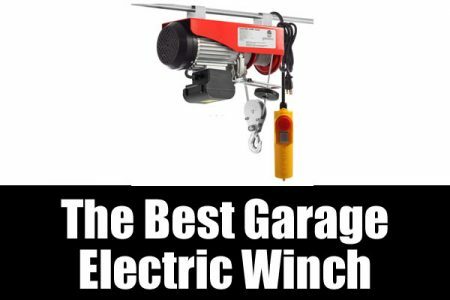 It scoops up and easily carries a 100 ft. ft. extension cord. Use the Utility Hook to hang any tool with a long handle and wide head such as brooms, sledgehammers and pitchforks. 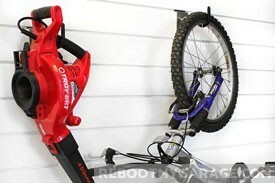 The Utility Hook is also a great alternative for hanging ladders and fat tire bicycles. The hooks have rubber coatings to protect stored items and can carry up to 50 lb. 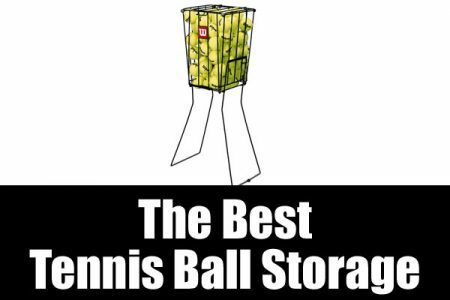 You can easily find the ball you want in a vertical tube or an organized stack. 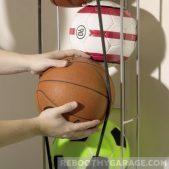 The Vertical Ball Rack combines a tube an da stack to give you access to basketballs and soccer balls. You can just as easily access the one on top as the one on the bottom. 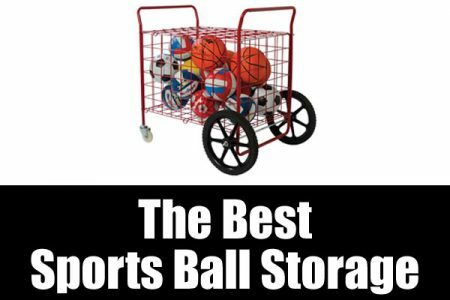 The Vertical Ball Rack is a steel tube. Bungee cords hold in the balls. You can push the cords out of the way to get the ball you want. You can see all the balls in the rack. 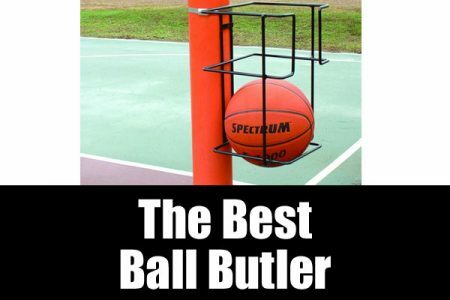 The Vertical Ball Rack holds up to 50 lbs. 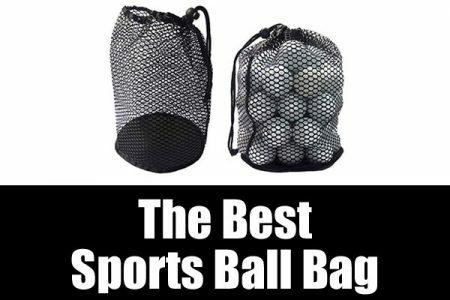 of kick balls, volleyballs, footballs, soccer balls and basketballs. I prefer solid over wire bins. Solid bins don’t allow stuff to fall through the sides and bottom. But you can easily see what’s in a wire bin. Just resist the temptation to store something in wire that will fall. Use this wire bin to hold gardening tools and plastic bottles. The basket is 24 in. wide and 13″ deep, so there’s a lot of room for storing cleaning products, baseball mitts or a pile of tennis balls. However, the grids are too large for golf balls. 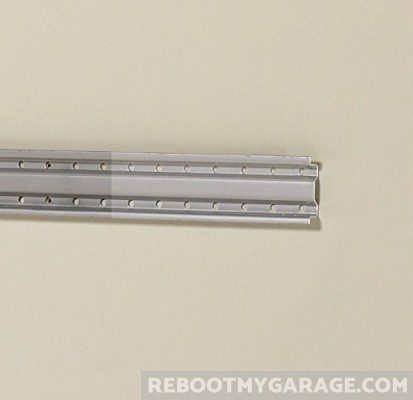 Your FastTrack Rail sits horizontally across your garage wall. The Vertical Rails allow you to add shelves and cabinets above or below the horizontal track. The FastTrack system is not required to mount the vertical racks. You can install them directly into the wall studs. But the advantage of the FastTrack rail is to allow you to easily move pieces without screws or nails. So it’s easier to use the vertical system with the horizontal tracks. 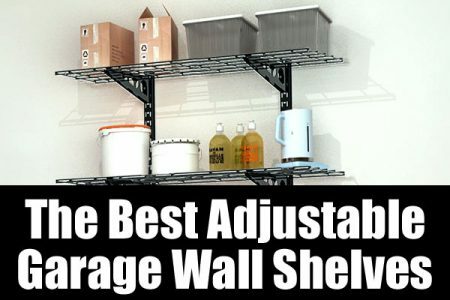 You can place Rubbermaid FastTrack shelves, cabinets and bins on the vertical rail. But read on for important information about the FastTrack cabinets. The vertical accessories have tabs on the back. The FastTrack Rail Access Bin is an open-topped storage box. The front opens like a mailbox door. The bin holds up to 25 lbs. You can hang the bin anywhere along the vertical rail. And you can move it somewhere else in about 20 seconds flat. Rubbermaid suggests using the bin for sports equipment, gardening supplies and household items. I just find this bin brilliant in its simplicity. You can access contents from the top or from the front door. 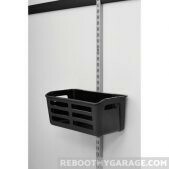 Get a set of bins to coordinate garage storage. 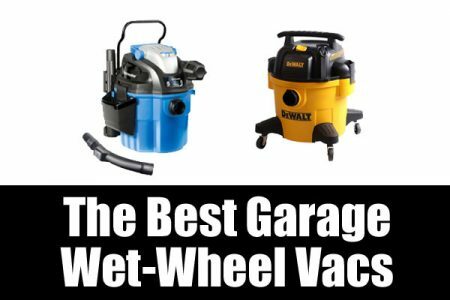 Use them for gardening, cleaning and auto maintenance supplies. The Access Bin holds up to 25 lb. and measures 16.2 W. x 9.8 H. x 2.2 D. inches. The Resin Bin is an outlier in the FastTrack lineup. It will successfully carry bottles and supplies, but it doesn’t hold its shape. So long as your expectations are sufficiently low, it’ll work for you. But the Rail Access Bin (above) might hold up better for you. When you find a perfectly good screw on the floor, what do you do with it? For 30 years, I’ve always put a found screw on the nearest flat surface. 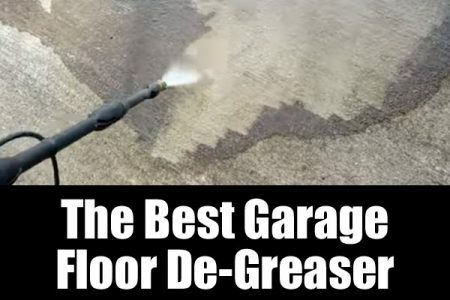 That’s how I ended up with the mess of a garage that drove me crazy. Randomly putting little things here and there, until all I had was clutter. Little items like screws and nails should be in a dust-protected home at eye level. That’s why I love the Rubbermaid FastTrack Rail Bench Blox Kit. And no, I have no idea where they got that name. I really dislike dust and bug junk all over my nuts and bolts. So I always look for closed-lid hardware solutions. The Blox kit keeps the hardware boxes at eye level. The lids are transparent. You know exactly which bin has the hardware you need. You can see inside the angled boxes. Lids to keep out the dust. So instead of putting that found screw on the nearest flat surface, it’s just as easy to put it in the Blox kit box. Each set of 5 bins holds 25 lbs., more than enough capacity for 5 boxes of nuts, bolts, screws and nails. Updated January 10, 2019. I originally cautioned against buying FastTrack cabinets because there were so many complaints that the cabinets were damaged during shipping. The MDF Wall Cabinet is still on the “Don’t Buy” list. 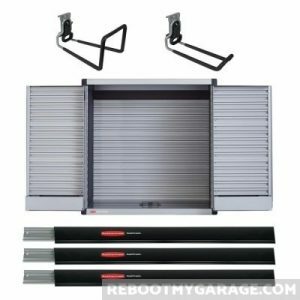 But the crazy-strong Tool Cabinet Bundle is an excellent cabinet I do recommend. 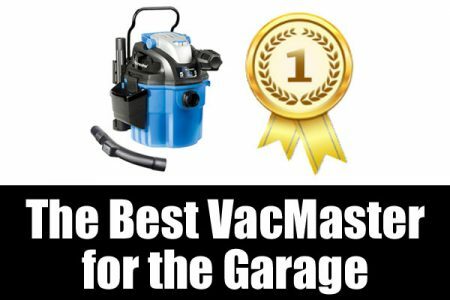 It’s not a low-cost product, but it is competitive with high-end cabinets that don’t have the advantage of simply hooking onto the FastTrack rails. And the competitors’ cabinets don’t come with free ladder and hose hooks. 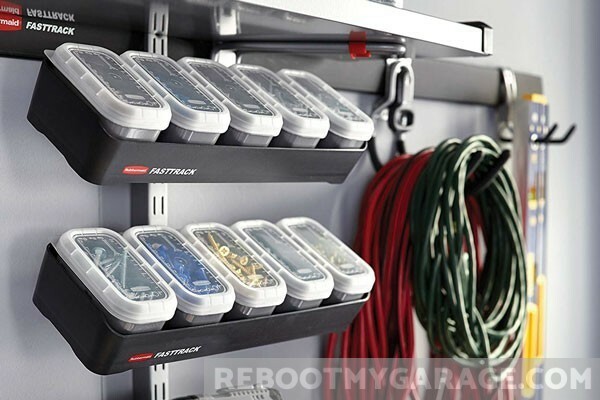 The FastTrack Tool Cabinet is tough and durable yet really nice to look at. The Tool Cabinet holds 1,750 lb. That’s right. 1,750 pounds. The doors have a magnet close, and support a padlock. So now we do have a FastTrack solution to lock up those dangerous pesticides. 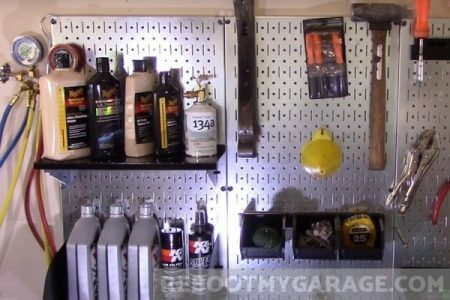 The crazy-strong Tool Cabinet Bundle is an excellent cabinet I do recommend. Original article continues below. Cabinets are a must for protecting your family from hazardous materials. Use caution when shopping for the Rubbermaid FastTrack Vertical Rail cabinets. Most FastTrack Rail are tough metal and plastic. The cabinets are MDF (fiberboard). They don’t handle shipping well. Beware that the vertical system wall cabinets don’t have a great reputation for surviving the shipping process. I’ve read many complaints written by cabinet customers who received damaged wall cabinets. To their credit, these are smart-looking and strong cabinets. If you buy the Rubbermaid FastTrack system, you might want the cabinets. If you buy these cabinets, be prepared for a few Amazon shipping return cycles. Or, get the cabinets at a brick & mortar store. Carry them home in your car. These cabinets don’t survive shipping well. Customers give them high marks once they’re installed. Customers give high marks to just about every other FastTrack accessory. When buying FastTrack cabinets, have patience, or buy locally. As a rule, I prefer bins to shelves. When a bin gets overloaded, it won’t accept more stuff. When a shelf gets overloaded, stuff falls off. So I have to give applause to Rubbermaid for recognizing this flaw and fixing it! The Rubbermaid FastTrack Rail Shelf has lipped edges. The edges help to prevent the shelf contents from falling off of the sides. I love the shelf edges. They’re a tiny engineering fix that make a huge difference. 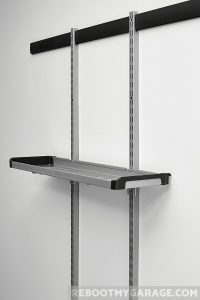 The FastTrack Rail Large Shelf is just less than three feet wide. The shelf has a 50 lb. capacity, so you could store a little bit more than 4 1-gallon water jugs on it. 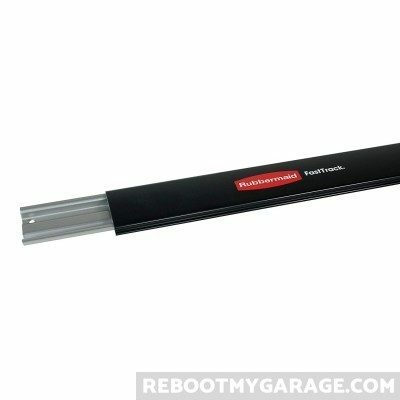 The Rubbermaid FastTrack Rail Small Shelf holds 25 lbs. and is half the size. 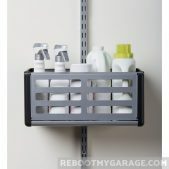 Rubbermaid suggests using the shelves for motor oil, flashlights and cleaning supplies. The Gardening Kit is a 16-piece solution that would make me super happy if I received it for my Birthday or the Holidays. 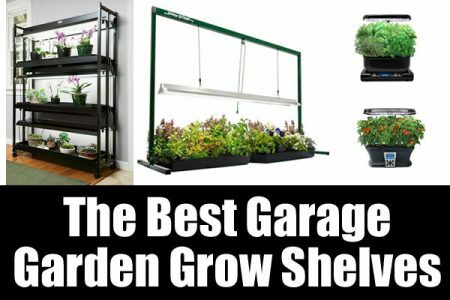 This gardening organization system includes four 48 inch rails, 6 hooks, 2 baskets and mounting hardware. You can follow the suggested hooks and bin placements. Or you can move the hooks and baskets anywhere on the horizontal rails. That’s the beauty of the FastTrack system. The FastTrack rails are easy enough to install. One person with a drill should be able to install the rail in a few minutes. Rubbermaid suggests mounting horizontal rails at 4 ft. high and a 7 ft. 3 in. high. You need 16 in. stud spacing to get the best load capacities. If you’re mounting the rails on 24 in. studs, reduce the load by a third. Do NOT install a 32 in. wide rail on 24 in. wide studs. A 32 in. rail must hit three studs to be secure. The vertical rails clip onto the horizontal rails. But you must do this at a stud to screw the vertical rails into the wall below the attachment. 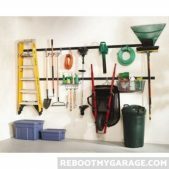 Does Rubbermaid sell any other garage organization systems or tools? Yes. Items include cargo storage boxes, outdoor deck boxes, shed storage hooks. 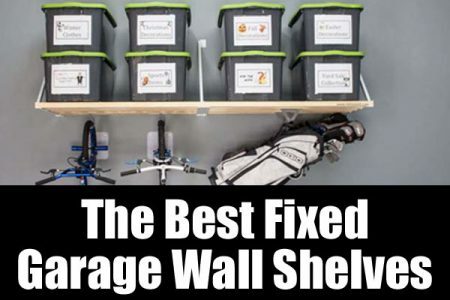 These will all get items out of your garage, which is a big part of re-claiming that space! How do I contact Rubbermaid for help? Their contact info is here and guarantee help is here. Where can I find FastTrack assembly instructions? Here!